A common trend over the past decade has been a shift in IT’s focus, from driving innovation in an organization, to managing increasingly complex and expensive systems. Today one of the most important reasons that companies leverage SIs or VARs to help build, implement and manage technology solutions is that technology is complex and companies need consultants and integrators they trust to help them make effective decisions and run IT (in-house or in the cloud). In spite of this dominant role, it’s ironic to note that many vendors, service and solution providers are currently selling cloud not as trusted advisors but rather as product sales people, e.g., based on price, its inherent technology merits, its “speeds, feeds, features and functionality”, or because “it’s big and you need to buy into it, so let’s do cloud”. The central issue is why should anyone buy into the cloud? Is cloud itself an end point or is it a means to an end? We at Channel Cloud Consulting think it’s a means to an end and the ‘smart’ trusted advisor sells the ‘end’ not the means if he wants to truly be ‘trusted’ and add value. So what is the end? 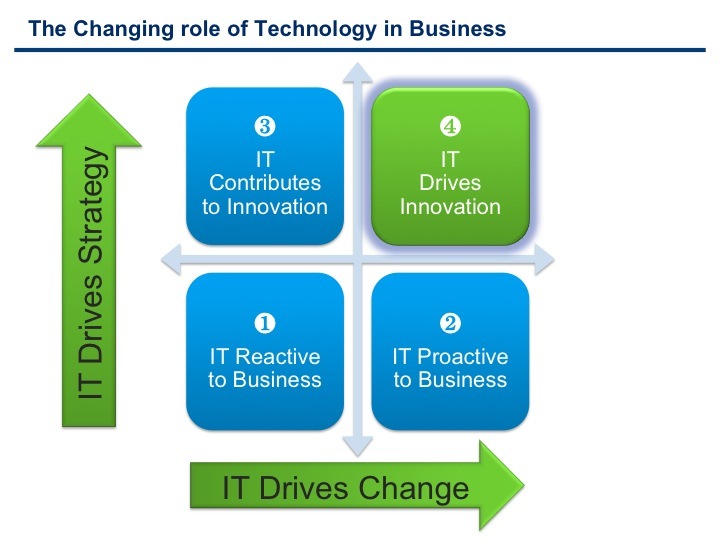 The end is that IT needs to move away from Reacting to the business (box 1 in the graph below) to more of a focus on Driving Innovation in the business (box 4 below). To achieve this end, IT needs to among other things off load the 80% of the time and money that IT spends maintaining and fixing things and spend that time figuring out how technology can become the engine of business model transformation. The IT organization, and the vendors that serve it, need to refocus and reprioritize, from managing complexity to driving process change and innovation and becoming an engine of competitive advantage. The vendors who sell cloud tools and the providers who deliver them to end users need to become educated on how IT is transformational and how we as an industry can guide end-user IT orgs to become drivers of innovation. Not a message that you hear a lot, but perhaps part of how we all drive Cloud Computing to happen faster and have a greater impact.